While there has been a previous commercial recording of Klemperer's Second Symphony and Merry Waltzes (EMI Classics) this was only briefly in the catalogue. I have long had considerable respect for the work of Alun Francis who has had to make his living in Scandinavia and Germany. His recordings of the Pettersson symphonies for CPO are fine documents. He also was the conductor for the 1970s Hyperion recordings of Thea King playing the clarinet concertos by Stanford and Finzi. The First Symphony is a strange amalgam of Weill-like angst and the cheerily manic - almost light music. Certainly it is entertaining. There are moments when it pitches towards Korngold but it lacks that composer's disconnection from emotional embarrassment. There is always the sense with Klemperer that he will hold onto his emotions like grim death. The second movement has a touching Berg-like concentration and communicative intensity (Wagnerian at moments e.g. 8.02) with much of the affekt achieved through the massed strings. The turmoil of the first movement returns towards the centre of the movement. There are times when these two movements seem ill-assorted rather than part of an integrated whole even if, taken individually, they each in their own way grip the listener. The Second Symphony is full of inventive little orchestrational touches (listen to the singing chuckle of the woodwind at 2:34 of the first movement and the shuddering whistle effects - very original. The second movement leans into Mahlerian adagio territory and we must remember that at this stage in his career he was the darling of EMI Classics and of concert-goers. There is a light-hearted and delicate third movement and a Beethoven-inflected finale. The Merry Waltz is gorgeous: contrast of intimacy with the grand sweep; a slightly dissonant edge and glittering percussion highlights. The Marcia Funebre is stern, searching and is complete with side-drum marking out the slow cortege. 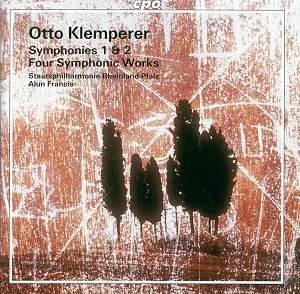 Once again the clink and tinkle of percussion signs off the score as a Klemperer composition. As with so much about this disc the recording team have done a great job in preserving and articulating Klemperer's caring and inventive placement of the percussion. Recollections is a slightly sentimental memento with the viola solo confirming the steadily paced progress and with references to Bruckner and Brahms along the way. The Scherzo is a hyper-romantic essay buzzing along full tilt with a Brucknerian confidence soon subborned by Weill-like angularity and a rasping and stern edginess. You may have been curious about Klemperer�s compositions so here is an opportunity to slake your thirst. How long I wonder before we hear the collected orchestral works of Weingartner, Karl Rankl (his Fifth Symphony sounds promising), Leslie Heward (Peer Gynt opera and much else) and Jan Krenz (at least one symphony which I heard broadcast during the 1970s). If I say that this is intriguing music you are going to read that as faint praise. That's not the intention. This is interesting music which takes some very oddball routes and decisions and which, quite understandably, is saturated with the composer�s concert experiences; how could it be otherwise? Puzzle your friends - yes. But this is also music that has the power to surprise and leave you pensive.